NEGEV (Ma’an) — Thousands of Palestinians participated in the annual ‘March of Return’ on Thursday afternoon near Bedouin towns in the Negev (Naqab) in southern Israel, commemorating the 1948 Nakba amid the conclusion of Israeli independence day celebrations. 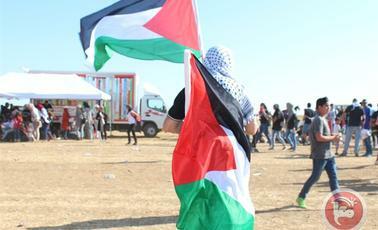 Palestinians in Israel, waving Palestinian flags and holding banners emblazoned with support for the Right to Return, made their way across the Negev in the dry afternoon heat as they called for the implementation of the Right to Return for Palestinian refugees and Palestinians internally displaced from their villages in Israel. The annual ‘March of Return’ is usually held on Israel’s independence day to commemorate the Nakba — or the ‘catastrophe’ — referring to the mass expulsion of Palestinians from their homes and villages during the 1948 Arab-Israeli war that wrought the state of Israel. The official commemoration of the Nakba is held on May 15 and is observed by millions of Palestinians and rights activists around the world. The aim of the march was to highlight the internationally-recognized right of Palestinians who remain refugees or internally displaced to return to their homes and villages in Israel, a right which has been enshrined in international law following the adoption of United Nations Resolution 194. Local Palestinians, activists, rights leaders, Knesset members, and leaders of the Higher Arab Monitoring Committee, participated in the 19th year of the annual march, launched each year from a site of a Palestinian village destroyed by Israeli forces in 1948. A moment of silence was held in order to memorialize the Palestinians killed and displaced in 1948, and was followed by the crowd pledging to preserve the Bedouin lands of the Negev and renewing their commitment to the Right to Return. The march was launched this year from the destroyed village of Wadi Zubala and continued near the Bedouin town of Rahat in order to underscore Israel’s ongoing destruction of Palestinian Bedouin villages throughout the Negev, as Israeli forces continue with a wave of demolitions against the approximately 160,000 Bedouins residing in villages not recognized by the state of Israel. Member of Knesset and head of the Arab Joint List, Ayman Odeh, told the crowd that this march was particularly important because residents who were displaced from the village of Wadi Zubala in 1948 fled to the unrecognized Bedouin towns of Atir and Umm al-Hiran, both of which have been slated for demolition in order to make room for the construction of a residential complex for Jewish Israelis. Some 750,000 Palestinians were expelled from their lands in 1948 and were scattered across refugee camps in the occupied West Bank, the Gaza Strip, Jordan, Lebanon and Syria, according to the United Nations Relief and Works Agency (UNRWA). Today, there are over five million Palestinian refugees who remain displaced from their original homes and villages following the mass expulsion that occured almost 70 years ago.